Back in January 2012 I described a technique for producing PSK31 signals that requires no multiplications or explicit wave shaping. It was based upon viewing the PSK signal not as a single modulated waveform but as as the sum of two unmodulated waveforms whose individual frequencies depend upon whether you are transmitting a one or zero. I used the algorithm to create a PSK31 audio beacon and even looked into implementing it in an FPGA to generate signals directly at RF. However, it quickly became apparent that while the algorithm works well in a microcontroller, it doesn’t lend itself to easy implementation in hardware. Then about six weeks ago I was considering the problem again and came to the conclusion that it wasn’t necessary to eliminate the multiplication and wave shaping if an efficient way to do it in hardware could be found. As it turns out, there is an algorithm well suited for doing this; the CORDIC (COordinate Rotation DIgital Computer) algorithm. The CORDIC algorithm was developed in 1959 by Jack E. Volder as a way to perform vector rotations and calculate trigonometric functions for the B-58 bomber’s navigation computer. 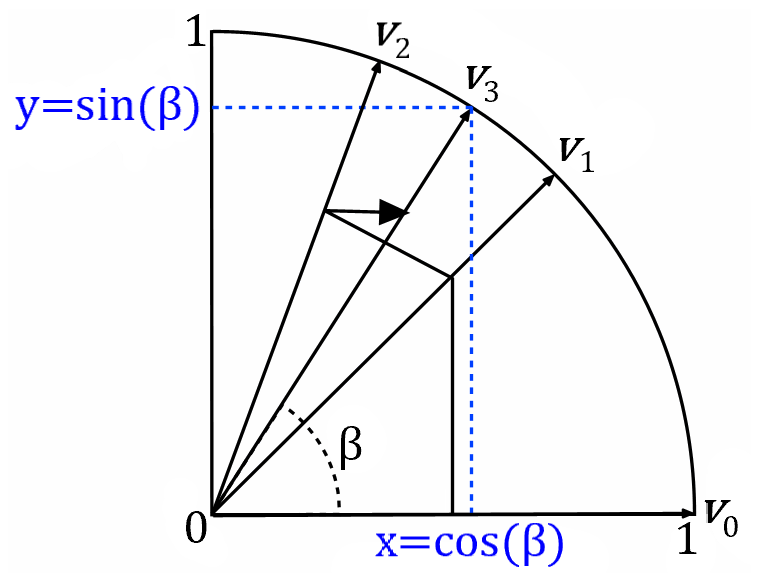 It requires an x/y pair representing a vector to be rotated, the angle by which the vector will be rotated, and works by incrementally rotating the vector by smaller and smaller angles, eventually zeroing in on the final rotation angle. The rotation angles are chosen so the they can be done using only basic arithmetic operations (addition, subtraction, and shifts), making it highly suited for implementation in hardware. The process is illustrated in the figure below. Start with a DDS (direct digital synthesis) signal generator producing the carrier to be modulated. On each hardware clock tick feed an x/y value and the modulating signal’s phase angle into the block implementing the CORDIC algorithm. X values are taken from the DDS output. Y values are set to 0. When transmitting a 1, keep the angle constant at +/-90 deg. When transmitting a 0, vary the angle linearly across 180 deg. The y outputs of the CORDIC block make up the modulated PSK31 signal. To prove to myself it would work, I wrote a PSK31 modulator using the CORDIC algorithm in VHDL. It’s composed of four parts; a DDS signal generator and ROM to produce the carrier, a phase accumulator/bit generator, the CORDIC phase shifter, and a controller. The block diagram is shown below. You can precalculate a desired value or calculate it on the fly using the technique described here. Phase Accumulator/Clock Generator – The phase accumulator has two functions; to generate a bit clock for the internal UART and to track the phase angle across the bit width. The clock generator consists of an accumulator that rolls over and puts out a pulse every 31.25 msec (the PSK31 bit width), indicating when a new bit is being shifted into the block for transmission. The phase accumulator tracks the phase angle to be fed to the CORDIC block. Internally, the phase is stored in an 8-bit register whose value depends on whether a 0 or 1 is being transmitted. When transmitting a 1 the value stays constant at 0. When transmitting a 0 its value increases from 0 to 255 across the bit width. The register value is mapped to a bit vector representing the individual CORDIC phase shifts needed to produce the desired final phase shift. Each register value from 0 to 255 represents a phase shift in the range from -90 deg to +90 deg. The size of the bit vector depends upon the number of stages implemented in the CORDIC block. To prevent carrier phase discontinuities when multiple 0s are being transmitted an inversion bit is provided. Assume a 0 is being transmitted. During the bit transmission the phase angle will vary from -90 deg to +90 deg. When the next 0 is transmitted jumping back to -90 deg would cause a carrier phase discontinuity. You actually want the phase to vary from +90 deg back to -90 deg. The inversion bit indicates to the CORDIC block it should invert the incoming x/y values before applying the phase shifts, which prevents the phase discontinuities from taking place. CORDIC Block – There are plenty of resources available that describe the inner workings of the CORDIC algorithm so I won’t repeat it here. For the purpose of this description, it’s only necessary to know that on each system clock tick the CORDIC block takes in three values (an x/y pair and a bit vector representing the phase shifts to be applied) and puts out three values (the x’/y’ pair representing the rotated vector and the original bit vector for that pair). As mentioned previously, x values at the input are taken directly from the DDS signal generator, y values are all set to 0, and the phase bit vector comes from the phase accumulator. Bit 0 of the bit vector is directly connected to the inversion bit. When set the incoming vector is inverted (180 deg phase shift) before applying the remaining phase shifts. The remaining bits represent the phase shifts defined by the CORDIC algorithm, which are presented in the table below. A 0 indicates a counterclockwise rotation, a 1 indicates a clockwise rotation. The algorithm is implemented as a pipelined structure, allowing it to process data at the full speed of the FPGA. Because of this there will be a delay between input and output that depends on the number of stages in the pipeline. The PSK31 signal is taken from the y values coming out the end of the pipeline. Controller – To maximize compatibility and ease integration, the controller was designed to conform to the WISHBONE System-on-Chip (SoC) Interconnect Architecture. It handles the signals and control registers required to present that interface to the outside world. Internally it also monitors the bit clock from the phase accumulator/clock generator, shifting new bits in to be transmitted as required. The block is controlled via a control and status register as defined in the table below. 1. Varicode data is 16 bits left aligned, to include the 00 separator. 2. Status and control bits are active high. To test the modulator I included a simple signal-delta DAC and integrated the combination with the ZPUino softcore processor on a Papilio One FPGA development board. Instructions for integrating new devices into the ZPUino core are available here. 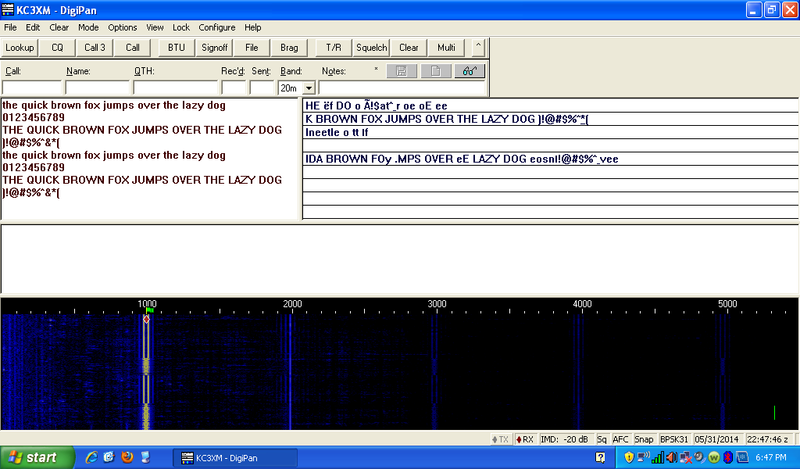 The figure below shows the output being decoded using Digipan through a laptop microphone. There’s some harmonic energy there but nothing that can’t be filtered out. The control script is available below. The sigma-delta DAC used in the test transmitter limits the PSK signals to the audio range. However, the core runs at the full speed of the FPGA so there’s no reason it couldn’t be modified to feed the PSK31 signal to an external DAC and generate signals directly at RF. That’s one of my next steps, along with integrating decoding software. For those who are interested, the VHDL and C code for the blocks and control script are given below. --     notice, this list of conditions and the following disclaimer. --     provided with the distribution. --  ADVISED OF THE POSSIBILITY OF SUCH DAMAGE. -- Temporary variable for range check. -- If value is still within the modulus clear the carry and keep the value. -- If value exceeds the modules then set the carry and wrap around. -- Memory has 250 8-bit signed values. q <= r_reg_out;           -- Connect block data out to accumulator data out. inversion <= r_inversion; -- Connect inversion data to the out port. -- Process to set output signals. -- to the appropriate state signals. -- Rising edge of the clock moves states to the output pins. -- Next value of the low register. -- Process for sampling the serial data stream. -- data is sampled on the leading edge of the PSK bit period. -- inversion. Otherwise, invert it. -- The data out enable flag matches the data being sent. -- Set the output data. -- Descriptor for data describing a shift block. -- Initialize the shift masks. -- 0 bit of the shift mask is always 0. -- Bits for the phase shifts go from the lowest order to the highest order. -- Lowest order bits are the largest angles. -- 0 indicates the angle at this point is negative. -- 1 indicates the angle at this point is positive. -- Index 0 of the shift stream will hold the incoming data. -- for each of the stages. -- Connect the last stage to the outputs. -- Read in the data and pass it through the pipeline. -- Reset the i and q data in the records. -- Don't do the first one since that's connected to the input. -- Pass the data down through the pipeline. -- Mask is clear so angle to be rotated at this point is negative. -- Mask is set so angle is to be rotated at this point is positive. -- Constants associated with the phase shifter. -- ZPUino has a 32 bit word size. -- Define the ROM used to hold the NCO values. -- Signals associated with the DDS NCO accumulator. signal dds_acc_inc_hi_i : std_logic_vector(DDS_INC_HI_WIDTH-1 downto 0);      -- upper accumulator increment. signal dds_acc_inc_lo_i : std_logic_vector(31-DDS_INC_HI_WIDTH downto 0);     -- lower accumulator increment. -- Signals associated with the DDS rom. -- Signals associated with the phase accumulator. signal psk_phase_acc_count  : unsigned(PSK_ROM_ADDRESS_WIDTH-1 downto 0);     -- phase accumulator output. -- Signals associated with the phase shifter. -- Signals associated with the phase shift ROM. -- Declarations used to define the array of ROM data. -- Instance of the NCO rom. -- Instance of the phase accumulator. -- Instance of the phase shifter. -- Instance of a simple 2 channel D2A converter. -- Acknowledge all tranfers per the wishbone spec. -- Connect accumulator register output to the ROM address lines. -- Reset signal is set. -- Store the value to be transmitted. -- the xmit data has been read. -- Update the DDS increment value. -- Load the phase from the accumulator to the phase shifter. -- Then rotate the transmit data 1 bit to the right. -- It's time to swap in a new bit. -- Done transmitting the old value. -- New value isn't ready so just send 0. -- New value is ready. Read it in and send the first bit. -- Still transmitting the current value so rotate the new bit in. -- Load the output data when address is read. -- Store the value to be returned. -- Load the audio output data. /* Define the PSK registers. /* Assign FPGA pins to the signal lines. /* Code is stored as two values, the upper and lower bytes. * 00 bits that separate varicode elements and one filled. B11111111, B10011111, // 33 ! B10101111, B10011111, // 34 "
B10101110, B01111111, // 46 . B10101011, B11001111, // 63 ? // Set the pin modes. // Set the PSK frequency. unsigned frequency_hz = 1000;       // DDS frequency in Hz.